The announcement of the Breakthrough Listen and Breakthrough Message initiatives was made today (July 20) in London. Making the announcement were (left to right) Internet investor Yuri Milner, physicist Stephen Hawking, cosmologist and astrophysicist Martin Rees, SETI research pioneer Frank Drake, co-founder and CEO of Cosmos Studios Ann Druyan, and UC Berkeley astronomy professor Geoff Marcy. A new $100 million, 10-year search for intelligent life in the universe was announced today (July 20) by famed scientist Stephen Hawking and other researchers. The first of the two initiatives announced today, Breakthrough Listen, will be the most powerful search ever taken for signs of intelligent life beyond Earth. The project will survey the 1 million stars in the Milky Way closest to Earth, as well as the 100 closest galaxies. The second initiative announced today, Breakthrough Message, will fund an international competition to determine the content of messages sent from humanity to alien civilizations. The pool of prizes rewarding the best messages will total $1 million, and the competition is open to everybody. Although Breakthrough Message is not committed to sending messages, "it's a great way to develop a degree of awareness of what it is to be human, to be self-aware, to be alive," Ann Druyan, creative director of the Interstellar Message on NASA Voyager and widow of famed astronomer and astrophysicist Carl Sagan, said at the news conference. Breakthrough Listen and Breakthrough Message are funded by Silicon Valley technology investor Yuri Milner, who was trained as a physicist. "In 1961, John F. Kennedy announced his dream of landing a man on the moon by the end of this decade," Milner said at the news conference. "Forty-six years ago, man made the first steps on the moon. That same year, 1961, Yuri Gagarin became the first human in space. It was an important year for humanity; we stepped out into the solar system. And it was an important year for me; I was born. My parents were so inspired by Gagarin's voyage that they named me Yuri. Later, I was told by my mother, who is right here in this room, that she wanted me to be inspired by what he did." Milner explained that the work of Frank Drake — who helped to pioneer the first modern search for extraterrestrial intelligence (SETI) — inspired him to become a physicist. 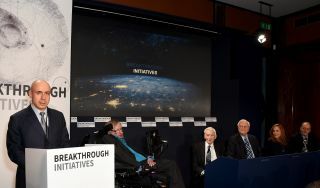 At the news conference, Drake noted the key challenge in finding government funding for SETI: "We cannot tell you how much it will take to succeed until we succeed," said Drake, who will lead discussions on Breakthrough Message's technical aspects. "We simply have to explore in the dark and hope people like Yuri Milner will keep us going for however long it takes for us to succeed." Breakthrough Listen will harness two of the world's largest telescopes — the 100-meter (330 feet) Green Bank Telescope in West Virginia and the 64-meter (210 feet) Parkes Telescope in Australia — covering 10 times more of the sky than previous SETI programs, scanning at least five times more of the radio spectrum and doing so 100 times faster. "We will be examining something like 10 billion radio channels simultaneously," planet-hunting pioneer Geoffrey Marcy, an astronomer at the University of California, Berkeley, said at the news conference. "We're listening to a cosmic piano, and every time we listen with the telescopes, we'll be listening not to 88 keys, but 10 billion keys." If a civilization based around one of the 1,000 nearest stars is transmitting at Earth with the power of a common aircraft radar, or if they are transmitting from the center of the Milky Way with more than a dozen times the output of the interplanetary radars that scientists on Earth use to probe the solar system, these radio telescopes can detect it. "It's a huge gamble, of course," added Lord Martin Rees, Astronomer Royal of the United Kingdom. "No one would count on success, but the payoff would be so colossal on recognizing that there was life elsewhere that this investment is hugely worthwhile." The project will also enlist the aid of the Automated Planet Finder Telescope at Lick Observatory in California to search for laser transmissions, using techniques 1,000 times more effective than previous efforts to detect interstellar laser signals, according to a statement from the researchers. From a "nearby" star 25 trillion miles (40 trillion kilometers) away, it could detect a 100-watt laser emitting the same amount of energy as a normal household light bulb,the statement added. "If the Milky Way actually has other intelligent species sending their spacecraft across the galaxy to settle around other stars on other planets, they might communicate using lasers," Marcy said. "There could be a galactic Internet not borne by copper wires, not borne by fiber optics, but carried by laser beams crisscrossing the galaxy." All of the data from Breakthrough Listen will be available to the public. The initiative will collect vast amounts of data — 10GB per second — the largest amount of scientific data ever made available to the public. "We will be able to generate as much data in one day that would have taken previous SETI searches one year," Milner said. The plan is for the Breakthrough Listen team to develop powerful open-source software to search through this flood of data. Scientists and members of the public can develop their own applications to analyze this data as well. "The hardware and the software used in the Breakthrough project will be compatible with other telescopes around the world, so they too can search for intelligent life," Milner said. Breakthrough Listen will also take advantage of crowdsourcing by joining and supporting SETI@home, the distributed computing project in which 9 million volunteers around the world donate spare computing power to search for signs of extraterrestrial life. "Collectively, it's one of the world's largest supercomputers," Milner said. Breakthrough Prize Foundation chairman Pete Worden noted they are discussing collaborations with the SETI Institute in Mountain View, Calif., which runs its SETI project using the Allen Telescope Array bankrolled by Microsoft co-founder Paul Allen. "We hope to begin conversations with many others over the years to mobilize the world's instruments for SETI research," Worden said. Marcy added that the Square Kilometer Array getting built in Australia and South Africa could lead to a 100-fold improvement in SETI research in the coming decade. If Breakthrough Listen does not discover extraterrestrial intelligence a decade from now, "as long as we collectively believe this is an endeavor worth funding, we should just keep funding," Milner said. "And I think if we do find something, I'm sure there will be a dramatic increase in funding in this project." "This announcement is great news for the astronomy community," said theoretical astrophysicist Abraham Loeb, chairman of the astronomy department at Harvard University. "Radio telescopes are in a bad situation in terms of federal funding." Drake noted that, while the search for extraterrestrial intelligence is exciting, years of detecting nothing "starts to get boring," and languishing without results for all that time "can be very bad for careers." Drake noted that scientists involved in the initiative will also be able to conduct other research, and Marcy noted that the radio telescopes could detect as-yet-unknown astronomical phenomena. It remains unknown, however, what form any extraterrestrial intelligence might take, if it exists at all. "There may be organic life out there, or maybe machines created by long-dead civilizations," said Rees, who is chairing the Breakthrough Listen committee. "But any signals, even if they are difficult to decode, would tell us that the concepts of logic and physics are not limited to the hardware in human skulls, and will transform our view of the universe." And making contact with aliens might be a very bad idea, Hawking warned. "We don't know much about aliens, but we know about humans," he said. "If you look at history, contact between humans and less intelligent organisms have often been disastrous from their point of view, and encounters between civilizations with advanced versus primitive technologies have gone badly for the less advanced. A civilization reading one of our messages could be billions of years ahead of us. If so, they will be vastly more powerful, and may not see us as any more valuable than we see bacteria." However, Rees did not share Hawking's concerns, and suggested "they may know we're here already." "We may get to a period in our future where we outgrow our evolutionary baggage and evolve to become less violent and shortsighted," added Druyan, who will lead discussions on Breakthrough Message's creative and cultural aspects. "My hope is that extraterrestrial civilizations are not only more technologically proficient than we are, but more aware of the rarity and preciousness of life in the cosmos."